St Peter won the Le Riche Cup for the first time in 12 years by beating reigning league champions St Paul's 4-3 in the final at Springfield. Kieran Lester gave St Paul's a fifth-minute lead, only for his strike to be cancelled out by Ruben Mendes-Pestana's equaliser two minutes later. Sol Solomon put St Peter ahead after 25 minutes, but Luke Watson made it 2-2. Second-half goals from Solomon and Karl Hinds put St Peter 4-2 up before Adam Trotter netted a consolation. 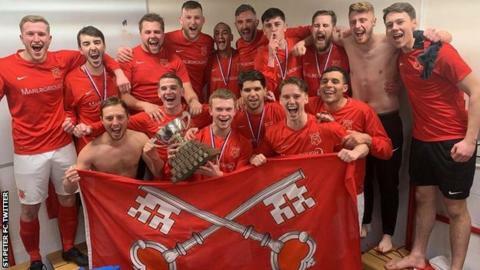 The parish side gained revenge after losing 2-1 at home to St Paul's in their key league clash on Saturday which all but guaranteed them a sixth-successive island title.